2 Bed / 2 Bath - Ariel Dunes - 15th floor / Amazing Views!!! Welcome to Destin!! Located along the Florida Panhandle. Destin is one of the top vacation locations in the southeast. Located in the Seascape Community. Ariel Dunes overlooks the adjacent championship golf course and provides visitors with a relaxing and comfortable escape, not to mention the breathtaking views of the Gulf of Mexico and Choctawhatchee Bay. Come, relax and enjoy this brand new Ariel Dunes luxury condo. The gorgeous beaches and emerald green waters await you at our two bedroom, two bath, fully furnished condo unit. For your convenience, Ariel Dunes provides a covered drive through check in entry, ground floor lobby, and large pools, one of which is heated. Beach and pool access is very convenient. Located on the 15th floor, the unit features 9 ft. ceilings, ceramic tile in the kitchen, baths, and laundry room. Plush carpeting compliment the living and dining areas and bedrooms. The kitchen and bathrooms have granite counter tops. The kitchen features Stainless Steel GE profile appliances. The unit also has 8 ft. glass panels in the living room and master bedroom with balcony access. The view from these rooms of the beautiful Gulf of Mexico is gorgeous. The kitchen is fully equipped with GE Profile Stainless Steel appliances which include a side-by-side refrigerator with front filtered ice and water dispenser, ultra quiet dishwasher, self-cleaning oven with a smooth top range and a built in microwave. To compliment these appliances the kitchen also features all utensils, plates, cookware, coffee maker, blender and a toaster. For your convenience a garbage disposal is provided. Adjacent to the kitchen is a laundry room equipped with a washer and dryer. The dining room features a table which seats 6 adults. There is additional seating at the built-in counter bar. The living room offers a very comfortable sofa which converts to a queen sleeper. Featured in the living room as well is a cozy accent chair with an ottoman and a rocker recliner for maximum comfort and relaxation. Located inside a massive armoire is a 42' LCD flat panel HDTV along with a DVD player. The 8 ft. glass slider in this room is complimented with custom made full length drapes with black out lining. 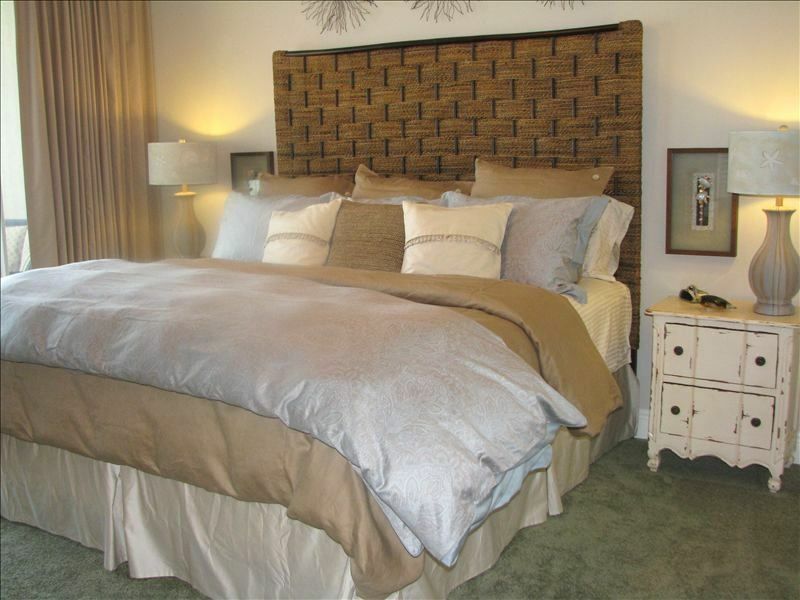 The master bedroom has a king bed and has been decorated with comfort in mind. It features dual side tables and lamps and a 32' LCD flat panel HDTV w/DVD and is displayed inside an oversized armoire. The armoire provides plenty of storage below behind doors. The 8 ft. glass slider is complimented with full length drapes with black-out lining, for the late risers. The view of the Emerald Coast can be enjoyed from the luxury of your bed or you can step out on the spacious balcony. Adjoining is the master bath featuring a full size glass stand up shower, adjacent to a full size garden tub. A huge his/her vanity is quite spacious for all your needs. The balcony is quite spacious. It features a loveseat with two chairs and a table. The view of the Gulf of Mexico is breathtaking. The guest bedroom has private access to the common bath and relaxing views of the onsite championship golf course and the Choctawhatchee Bay. The queen size bed is complimented by a side table with a lamp and a sweater chest which provides excellent storage. Atop the sweater chest is a 26' LCD flat panel HDTV w/DVD. Ariel Dunes provides plenty of amenities for everyone. For your enjoyment there are two large pools. One of the pools is a walk in pool featuring a mushroom waterfall that all kids will love! The remaining pool is seasonally heated and is great for relaxing, swimming, or just soaking in the sun. For your convenience, cabanas are located near each pool. The open shoreline of the Gulf of Mexico associated with Ariel Dunes is magnificent and strictly for your enjoyment and pleasure. Tired of relaxation - shopping is at a premium with Silver Sands Outlet Mall, Village at Baytowne Wharf, and Destin Commons Mall. Located very near Ariel Dunes are a number of wonderful restaurants. There are many activities on site or nearby. They include golf, tennis, sail boating, waterskiing, parasailing, jet skiing, snorkeling and diving, windsurfing, biking, antiquing, movie theaters, miniature golf (The Track) and water parks (Big Kahunas). You can also charter fishing with privately owned fishing fleets, arrange Sunset Cruises and Glass Bottom boats are available. For information purposes: If you, family and/or friends are traveling together and need an extra unit, I have several friends with units at Ariel Dunes also. I will be happy to assist you with this need. Thank you for considering us for your vacation destination! Three (3) TV'S, Cable, Fully Furnished Kitchen, Private Balcony, Bed and Bath Linens Provided (Bring Your Own Pool and Beach Towels) Pets Not Allowed & No Smoking. Property was in a good location, be mindful of traffic when planning activities. Condo was very nice and the owners were very helpful. We love it. Conda is BEAUTIFUL, and spacious. Looking forward to coming back. We love the condo! It was everything we expected and more. From the large balcony to the amazing view, plus all the amenities of home. If we ever come back to this area, we will definitely try to stay at this condo again. Allon was more than accommodating and checked on us multiple times to make sure all of our needs were met. He was a great guy who wanted to make sure our vacation was memorable. Loved the condo! We stay here every year! This condo has absolutely everything you need and all the comforts of home. This condo is personally taken care of by the owners, and it shows. My favorite is all the beach and pool accessories that are available. Floats, boogie boards, lots of beach chairs, sand toys, and a beach cart. The restaurant on site is nice for nights you feel like staying in. We also enjoyed the two large pools and the golf course which is on the property. This is our fourth time staying in this unit. We love it and so will you! Great place to stay, feels like home! This condo has every thing you could possibly need while on vacation. We had a fully stocked kitchen, they provide beach chairs and sand toys. The best part is the HUGE deck over looking the pool and the gulf. We can't wait to go back! Beautiful Condo!! Definitely 5 stars!! Love your condo!! My BFF and I recently stayed in your condo, and we couldn't have been more thrilled with our accommodations! The condo is beautifully furnished. Everything was so comfortable! The kitchen is well stocked. We had everything we could possibly need! And, kudos to your housekeeper! We found the condo to be spotless when we arrived!! The view from the balcony is incredible! The pools are spacious and sparkling clean! Thanks to Dianne and Larry for being very easy to work with! We will definitely return in the future! Great Inshore & Offshore Fishing! No Smoking! No Pets! We do not rent to anyone guest under the age of 25. No Hidden Fees or surprises! No check-in or check-out required. At booking, you will receive a code to the door for the dates of your stay and arrive and depart whenever convenient for you.